Yael Bartana Mary Koszmary (Nightmares) (video still). Photo courtesy Annet Gelink Gallery, Amsterdam; and Foksal Gallery Foundation, Warsaw. For 10 weeks, Walker assistant curator Bartholomew Ryan will share “chapters” from his extended keynote essay on the themes and work in 9 Artists, an international, multigenerational group exhibition examining the changing role of the artist in contemporary culture. 9 Artists premiered at the Walker in late 2013 and early 2014, before traveling to the MIT List Center for Visual Arts, where it was on view from May 9 to July 13, 2014. Here is the ninth installment of this 10-part journey. If anyone remembers that confrontation, whatever your political position in relation to the Occupied Territories, the withdrawal from Gaza initiated by then prime minister Ariel Sharon was fairly unprecedented. Video footage showed rows of seated settlers with arms entwined challenging the IDF, who pulled them one by one from their ranks to cries of “traitor.” The historical violence accompanying the vision of Jew against Jew was moderated (or perhaps accentuated) in a fascinating way by the obvious respect and tact with which the forces of the state went about their business. Here then were some kids, who in reenacting the whole affair were perhaps mocking it, puncturing the national mythology of unity of intentions and asking new questions about identification. But they were also duplicating by default the conditions of the event—the lines between oppressor and the oppressed became blurred; the ultimate sense being that of people locked within a structure, the rules for which have been ordained, which must play itself out whatever their personal feelings on the matter. A constructed scenario then, found by the artist, was documented and translated into an artwork and then transferred to a performance on the concrete landing of an idyllic New York urban park, itself associated through the years with various activist movements. Titled Wild Seeds in America, the game commenced at Union Square, about fifteen of us clumped on some dusty blanket. We had been instructed to occasionally throw out sentences such as “No, we won’t move” or “You can’t force us.” I remember starting it fairly nonchalantly, surrounded by a gathering random audience, and thinking that I should be careful not to hit my head (the game was potentially lethal, by the way; I had helped secure the permit, so that was another concern). Two big guys began patiently pulling us out, looking for the weak link, starting on the edges, like friendly wolves. About fifteen minutes in, it became obvious that this was not a game but an unfurling tragedy: each time someone left the group you could feel the gasp of the crowd, feel a heaviness and loss. The stakes became higher, the imperative to remain together stronger. As the wolves tired, a member of the crowd joined them, gleefully participating in the dismantling. At some point I was extracted, fingers ringing as they were unclasped from someone’s leg. I stood with the crowd, watching as it came down to two women holding each other tightly. They were being pried apart when one of them screamed, “You’re hurting me.” The wolf unclasped her, and she quickly grabbed her comrade again, clamping in tight, laughing. But yeah, it was a pyrrhic victory. All that good stuff that goes into the making of who we are or believe we are as people in distinct places at distinct times. With Wild Seeds in America, the artist had created a very simple social experiment; each participant in the event in the park naturally identified with their role, and despite the looseness of the ideological underpinnings of various positions, felt a desire to unify, to protect, to be part of and to defend a group. Perhaps this interest in how groups form themselves is partly influenced by the fact that Bartana has spent much of the last decade outside of Israel, first in the Netherlands, then Poland, and now Berlin. In a recent conversation, she spoke of the condition of being an immigrant: “The writer Eva Hoffman said that every immigrant is an amateur anthropologist. You’re always an outsider as an immigrant: you look at society in a different way. The same thing can partially happen when you step outside of your own nation and look back at it.”5 Bartana became increasingly interested in the inherent conflicts of Israeli society and identity, the Utopian promise of socialized collectivity and unity offered by the state’s formation and Zionist rhetoric, together with the inherent blind spot: the problem of displacement that necessarily attended the formation and maintenance of a state formed around Jewish identity. Where initially these investigations were focused specifically on Israeli identity, they became abstracted to a more general interest in how individuals and groups are socialized. Yael Bartana’s and Europe will be stunned. Neon. Photo courtesy the artist and Annet Gelink Gallery, Amsterdam. Bartana has taken up this impulse to create scenarios that border on social engineering in subsequent works, but always with an eye toward creating a self-awareness in participants that mitigates any sense of pure (i.e., fascist) manipulation. Such works take on a feeling of reality through the artist’s clever casting of real political and social figures and keen attention to, and reuse of, past documentary conventions. 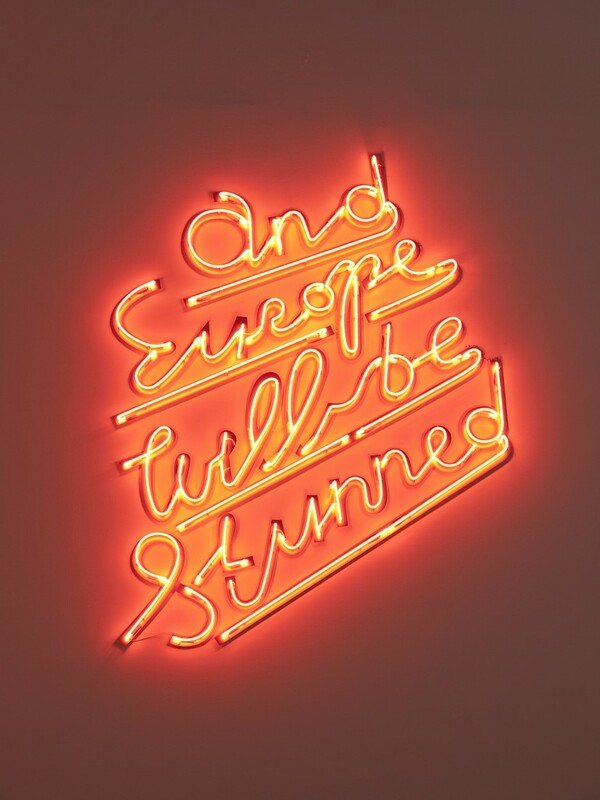 The most celebrated project within this body of work is and Europe will be stunned (2007–2011), which recently entered the Walker’s collection. It is significant in and of itself that the work debuted in a dramatic installation at the 54th Venice Biennale, where the artist represented the Polish Pavilion, the first non-Pole to do so. At the time of the project’s conception, Bartana had spent time in Warsaw, and noted a nostalgia among the intelligentsia there for the Jewish culture absent since WWII and subsequent pogroms. The works document the rise of the Jewish Renaissance Movement in Poland (JRMiP), a real group founded by the artist, but with a fictional history that the videos relate. In Mary Koszmary (Nightmares) (2007), a charismatic young man played by Polish activist Sławomir Sierakowski, founder and chief editor of Krytyka Polityczna magazine and a co-author of the speech, stands in the empty and overgrown Olympic Stadium in Warsaw, surrounded by a handful of children dressed up as scouts (or proto-Fascists, depending on your point of view). Standing on a small dais, with a 1940s-style microphone, white shirt, red tie, and a leather coat cast about his shoulders, the speaker makes an impassioned speech that echoes around the stadium. He calls out to “Jews” and declares that Poland is haunted by their absence. He describes an old woman who wakes at night experiencing nightmares provoked by the repressed memory of how the Polish people betrayed their Jewish neighbors. He declaims, “Let the three million Jews that Poland has missed stand by her bed and finally chase away the demons. Return to Poland. To your country. … This is a call, not to the dead, but to the living.” Meanwhile the children use stencils to spell out large chalk letters on the grass, and the camera pulls back to give a sweeping view: “3,300, 000 Jews can change the life of 40, 000, 000 Poles.”6 The speech is a cry for diversity, a statement that challenges both the Polish history of anti-Semitism and its current rising tide of nationalism and raises provocative questions about two key and at times competing visions of Jewish identity: the diasporic versus the Zionist. The aesthetics of the film borrow from Leni Riefenstahl’s legendary Nazi propaganda documentaries of the Nuremberg Rallies, such as Triumph of the Will (1935), full of pulsing crowds, impassioned Aryan youth, and rhetorically savvy Nazis. Yet, rather than duplicate Hitler’s anti-Semitism, the speaker embraces the Jews as crucial to a healthy Polish culture. And rather than address a throng of supporters, here the man receives the attention of a few children. The film ends with the leader and the children marching a motley and disorganized crew around the stadium. In the second film, Mur i wieża (Wall and Tower) (2009), the JRMiP has become an emerging force within Polish society. Inspired by the words of its founder, a group of Jewish immigrants labor to build a kibbutz in downtown Warsaw on the site of the former Jewish ghetto. The film is highly idealized, featuring visual stylizations (close-ups of workers staring optimistically into the distance) and an upbeat soundtrack borrowed from Zionist propaganda films of the 1930s. The effect is of a people determined to build a new life, steadfast in their faith in the possibilities of the future. The enthusiastic laborers design a flag that combines the Star of David with the Polish eagle; they learn Polish, and seemingly embrace their new life. Yet all is not quite as it seems; the kibbutz is surrounded by barbed wire, and it becomes a symbol of communitarian liberty, while also conjuring concentration camps (keeping people in or defense (keeping people out). At the film’s close, elderly Polish citizens stare at the kibbutz warily. Perhaps they are not as ready for the return as one might hope: there are ghosts, after all. His speech is compelling, and one can certainly see his point, yet as he talks a woman emerges from the crowd, suitcase in hand, and approaches the stage, standing below him, looking steadfastly into the camera. She is the Polish Rivka, a fictional character that has haunted the films through their three iterations; she is the “ghost of return” that refuses to go away, the embodiment of the Holocaust but also a spirit of renewal. Trapped in the loop of history, she says in an earlier monologue, “I am here to weave the torture of identity from the threads of forgetfulness.” In the context of Bartana’s film, Rivka is the enigmatic ghost who reaches beyond language, who bypasses the rational rhetoric of London. She might represent equally the right of return of the Palestinians, of the Jews, of citizenship, of memory, of a certain kind of hope or justice. Perhaps it is with Rivka that we find Roelstraete’s theology? I hope so. Whatever the case, Bartana has woven from the tortured strands of identity a trilogy that ultimately opposes itself to nationalist posturing, that seeks to suture and expose the wounds of history, that takes language out of the mouths of the eloquent and passes it into a cavernous realm of complexity and possibility. 1The exhibition OURS: Democracy in the Age of Branding was hosted and organized by Parsons The New School for Design and curated by Carin Kuoni, director of the Vera List Center for Art and Politics. It launched the center’s 2008–2009 program cycle titled Branding Democracy. Along with Jakob Schillinger, I served as a curatorial assistant for the exhibition. Accessed June 10, 2013. 2Bartana’s performance Wild Seeds in America (2008) took place in New York’s Union Square on October 19, 2008. It was commissioned for the exhibition by Parsons The New School for Design. 3Yael Bartana, och Europa kommer att häpna = and Europe will be stunned, Moderna Museet Malmö Utställningskatalog Series no. 357 (Malmö and Berlin: Moderna Museet Malmö and Revolver Publishing, 2010), 24. 4In a conversation convened with Bartana and several others in Frieze art journal in 2004 to discuss the relationship between art and documentary, it emerged that they had little in common: some intervened within the fabric of reality to construct their scenarios, others such as Bartana apparently did not. Yet, when artist Anri Sala asked, “Why are we all around this table? Our practices are all very different,” Bartana responded, “But we have one thing in common. We are not documentary filmmakers.” What precisely the artist meant by that was not perhaps so clear at the time, though it certainly seems prophetic now. See Jörg Heiser and Jan Verwoert, “‘What’s the Difference?’: Discussing the relationship between art and documentary filmmaking with artists Yael Bartana, Annika Eriksson, Anri Sala and Gitte Villesen,” Frieze 84 (June–August 2004), accessed June 10, 2013. 5Yael Bartana, “A Conversation Between Yael Bartana, Galit Eilat & Charles Esche,” in och Europa kommer att häpna = and Europe will be stunned, 47. 6See Yael Bartana, Mary Koszmary (Nightmares), YouTube video, posted by “Yael Bartana” on March 5, 2012. 7See Yael Bartana, Zamach (Assassination), YouTube video, posted by “Yael Bartana” on March 5, 2012.